Corticogenesis in a mouse brain. Subplate neurons are coloured yellow. Homeobox protein EMX1 is a protein that in humans is encoded by the EMX1 gene. The transcribed EMX1 gene is a member of the EMX family of transcription factors. The EMX1 gene, along with its family members, are expressed in the developing cerebrum (also known as the telencephalon). Emx1 plays a role in specification of positional identity, the proliferation of neural stem cells, differentiation of layer-specific neuronal phenotypes and commitment to a neuronal or glial cell fate. The precise function of the Emx1 transcription factor is not known, however its ubiquitous nature throughout corticogenesis suggests it may confer cellular identity to cortical neurons. Emx -/- (mice that have had Emx1 gene knocked out) are still viable and display only slight defects. These defects are restricted to the forebrain. Histologically and molecularly, the structures of the cerebral cortex appear to be normal. The hippocampus in Emx1 -/- mice, however, is typically smaller. The major deficit in Emx1-/- mice is that they completely lack the corpus callosum. Most of Emx1 transcript is detected in nuclei cells of the developing telencephalon, including the prospective cerebral cortex, olfactory bulbs and hippocampus. Emx1 is present in practically all cortical neurons during proliferation, migration, differentiation and maturation. However, the amount of Emx 1 varies. Emx1 first appears at E9.5 in its respective mRNA, until E11.5. After this, the Emx1 signal becomes particularly potent in the ventricular zone (VZ) until E17.5. At birth and shortly thereafter, Emx1 levels in layers V and VI as well as in the SP increase. Emx1 and Emx2 each play a critical role in regulating dorsal telencephalic development and are amongst the earliest expressed pallial-specific genes. During embryonic development, the telencephalon is the birthplace of a diverse collection of neuronal and glial cells. 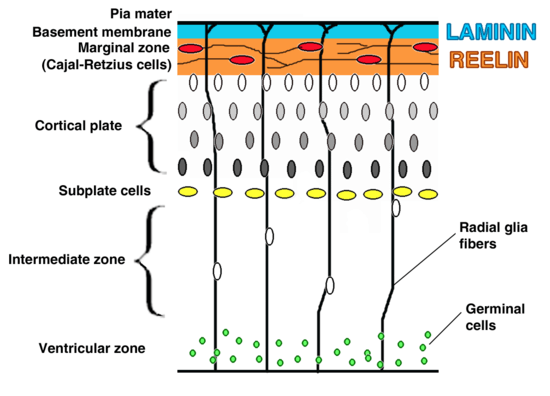 These cells undergo varying patterns of cell migration in order to reach their final positions in what will become the mature cerebral cortex and basal ganglia. The embryonic telencephalon is subdivided into dorsal pallium and ventral subpallium. These two pallia become the mammalian cerebral cortex and basal ganglia, respectively. Medial Pallium (MP) Gives rise to archicortex, including the hippocampus. Dorsal Pallium (DP) Foundation of the neocortex. Ventral Pallium (VP) Claustromygdaloid complex generated here. Each of the aforementioned pallial domains will give rise to a distinct neuroanatomical region of the developed human brain. Lateral Ganglionic Eminence (LGE) Generates the striatum. Medial Ganglionic Eminence (MGE) Generates the pallidum. The dorsal and ventral telencephalic domains can be distinguished embryonically through distinct gene expression patterns. These genes are regionally restricted and take part in identity specification of the area of the telencephalon in which they are expressed. Developmental targets of the embryonic telencephalon. Emx1 expression has been shown to start from E9.5 (see gestational age). In the developing mouse embryo, the Emx genes are expressed principally in extended regions of the developing rostral brain, including the cerebral cortex, olfactory bulbs and olfactory epithelium. Emx1 gene expression is constricted to the dorsal telencephalon. From E9.5 until post-natal stages, Emx1 expression is associated with cortical neurogenesis, differentiation and migration, and synaptic connection generation. This suggests that Emx1 plays a crucial role in determining the identity of the developing cortex. Emx1 is not only limited to the telencephalon, rather it is also expressed in branchial patterns and in the apical ectodermal ridge of the developing limbs. At E9.5, Emx1 expression can be witnessed within the dorsal telencephalon slightly anterior to the boundary between the diencephalon and telencephalon Emx1 is expressed in most cortical neurons within the developing telencephalon. Expression can be seen irrespective of whether the neurons are proliferating, migrating or differentiating. This means that in the developed cerebral cortex, the transcript for Emx1 is widely distributed. While distribution of the transcript may be seen throughout the developed cortex, the transcript intensity varies greatly according to developmental time. For example, the transcript for Emx1 is shown to be stronger in the ventricular zone (VZ) between E10.5 and E17.5. However, around birth and immediately thereafter, the Emx1 transcript is absent from the marginal zone (MZ), only becoming stronger in cortical layers V and VI as well as subset subplate (SP) neurons. In cortical layers V and VI as well as the SP neurons, Emx1 might take part in development of early functional circuitry, as well as in defining specific cellular identities. The distribution of Emx1 is so ubiquitous in the developing brain that in mid- and late-gestation embryos, as well as postnatal mice, it is found in cerebral cortex, olfactory bulbs, dentate gyrus and hippocampus. The Gli3 zinc finger transcription factor has been shown to play a role as a regulator of Emx1. In Gli3 Extra-toes mutants, the transcription factor Gli3 is mutated and as a result, Emx1 and Emx2 gene expression is lost. ↑ "Entrez Gene: EMX1 empty spiracles homeobox 1". 1 2 3 Cecchi C, Boncinelli E (August 2000). "Emx homeogenes and mouse brain development". Trends Neurosci. 23 (8): 347–52. doi:10.1016/S0166-2236(00)01608-8. PMID 10906797. 1 2 3 Schuurmans C, Guillemot F (February 2002). "Molecular mechanisms underlying cell fate specification in the developing telencephalon". Curr. Opin. Neurobiol. 12 (1): 26–34. doi:10.1016/S0959-4388(02)00286-6. PMID 11861161. ↑ Frantz GD, Bohner AP, Akers RM, McConnell SK (February 1994). "Regulation of the POU domain gene SCIP during cerebral cortical development". J. Neurosci. 14 (2): 472–85. PMID 7905511. ↑ Theil T, Alvarez-Bolado G, Walter A, Rüther U (August 1999). "Gli3 is required for Emx gene expression during dorsal telencephalon development". Development. 126 (16): 3561–71. PMID 10409502. Simeone A, Gulisano M, Acampora D, et al. (1992). "Two vertebrate homeobox genes related to the Drosophila empty spiracles gene are expressed in the embryonic cerebral cortex.". EMBO J. 11 (7): 2541–50. PMC 556729 . PMID 1352754. Solaro P, Greger B, Kemper B (1995). "Detection and partial purification of a cruciform-resolving activity (X-solvase) from nuclear extracts of mouse B-cells.". Eur. J. Biochem. 230 (3): 926–933. doi:10.1111/j.1432-1033.1995.tb20638.x. PMID 7601155. Briata P, Di Blas E, Gulisano M, et al. (1997). "EMX1 homeoprotein is expressed in cell nuclei of the developing cerebral cortex and in the axons of the olfactory sensory neurons.". Mech. Dev. 57 (2): 169–80. doi:10.1016/0925-4773(96)00544-8. PMID 8843394. Santi E, Capone S, Mennuni C, et al. (2000). "Bacteriophage lambda display of complex cDNA libraries: a new approach to functional genomics.". J. Mol. Biol. 296 (2): 497–508. doi:10.1006/jmbi.1999.3471. PMID 10669604.